An interesting aspect of the Shantae series is how its presentation and execution has evolved over time. While the first game, being released in the twilight years of the 8-bit Game Boy Color, represented the diminutive handheld being pushed to its absolute limits, the two subsequent installments in particular made a specific effort to be “modern retro” titles — games that emulated experiences from systems of the past while providing modern-day conveniences. Risky’s Revenge, which we’re concerned with today, very much has its sights set on the 16-bit era. 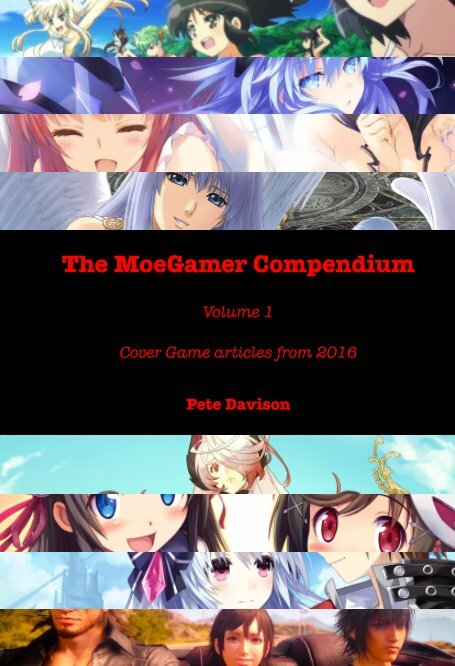 And it explores this concept with a clear knowledge and understanding of not only the classic 16-bit consoles, but also the earlier 16-bit home computers. Originally released in 2010, Risky’s Revenge is a direct follow-up to Shantae in which, as the name suggests, recurring series antagonist Risky Boots is back and up to no good once again. 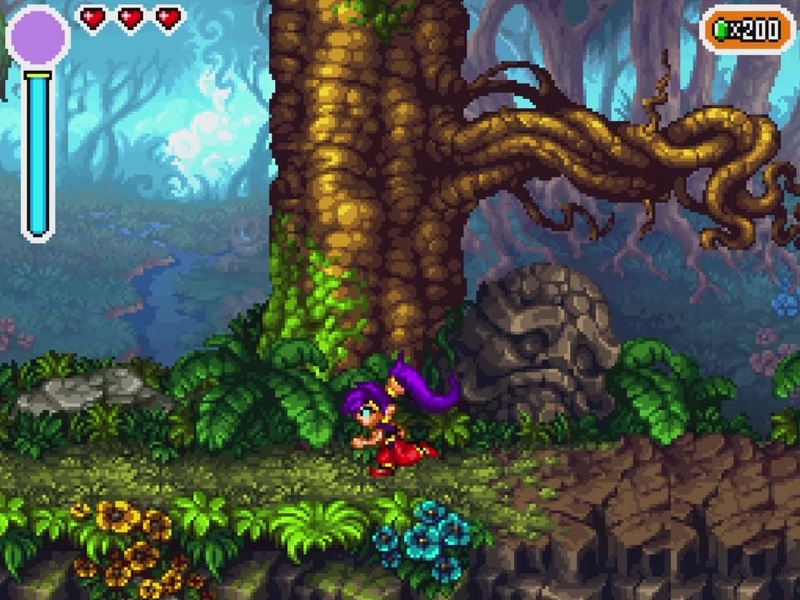 It was originally designed as an episodic game with Castlevania-style RPG elements including visible damage numbers — a minor element that would actually show up in the third game Shantae and the Pirate’s Curse — but ultimately WayForward decided the best thing to do would be to put out a single game rather than breaking it into bits. Early screenshots seem to suggest we may have lost out on a few areas in the process — most notably a snowy, mountainous area akin to the original game’s Mount Pointy — but they’re not really missed, to be perfectly honest. The game was initially released as a downloadable game for Nintendo’s DSi hardware revision of its dual-screen DS handheld platform, and quickly came to be regarded as a showcase title for both the service and the system. It was ported to iOS a year later but trust me, you really don’t want to play this game with a touchscreen. 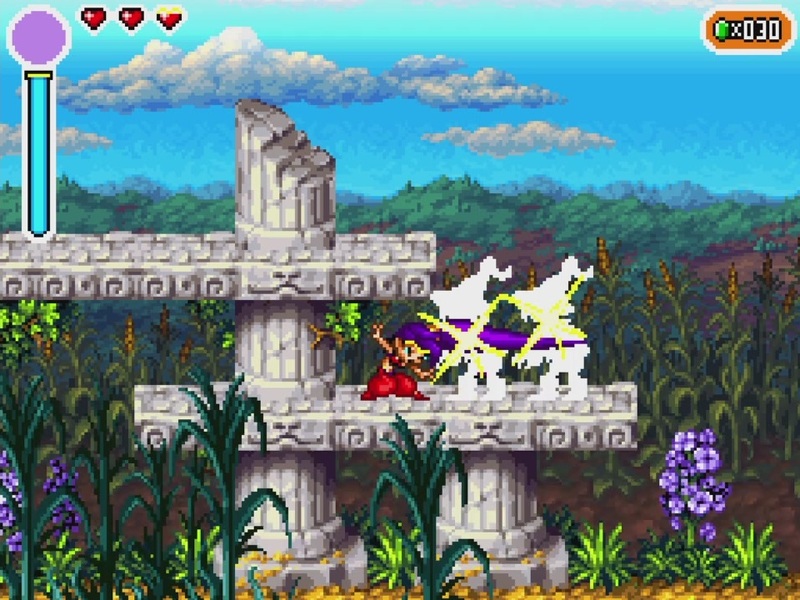 The original game and Risky’s Revenge were so well-received WayForward actually ended up working on three separate Shantae-related projects simultaneously at one point: a sequel to Risky’s Revenge called Shantae and the Pirate’s Curse, a Kickstarter-funded fourth installment with high-definition traditionally animated graphics rather than pixel art called Shantae: 1/2 Genie Hero, and a Director’s Cut release of Risky’s Revenge for Windows PC and, subsequently, PlayStation 4 and Wii U. This latter release actually stemmed indirectly from a stretch goal for 1/2 Genie Hero, which would provide a selection of different costumes for Shantae besides her now-iconic default outfit. 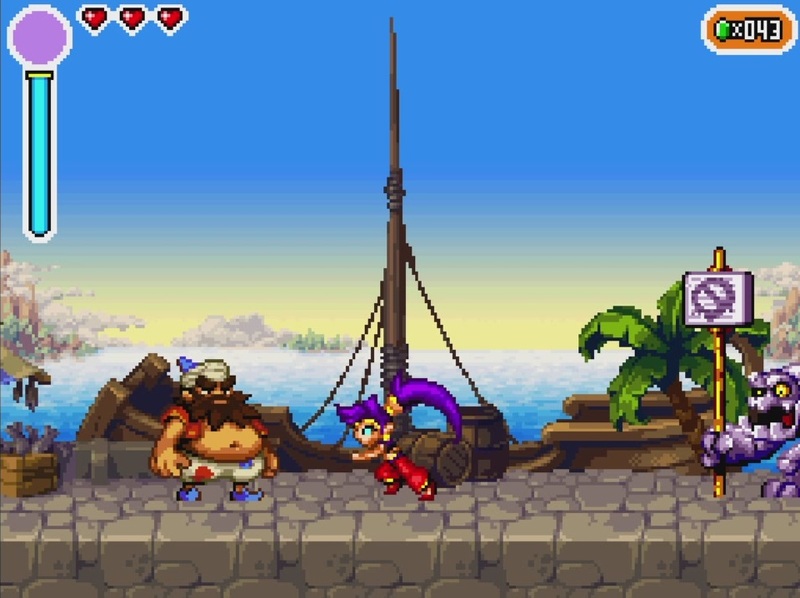 In 2013, in celebration of reaching said goal, the team added a “dancer” costume to the iOS version of Risky’s Revenge, which, when donned, caused Shantae to take more damage but be able to use magic more frequently. This new costume (which was effectively a harder game mode) was added to the PC port alongside a reimagined fast-travel system, and the result was Risky’s Revenge: Director’s Cut. 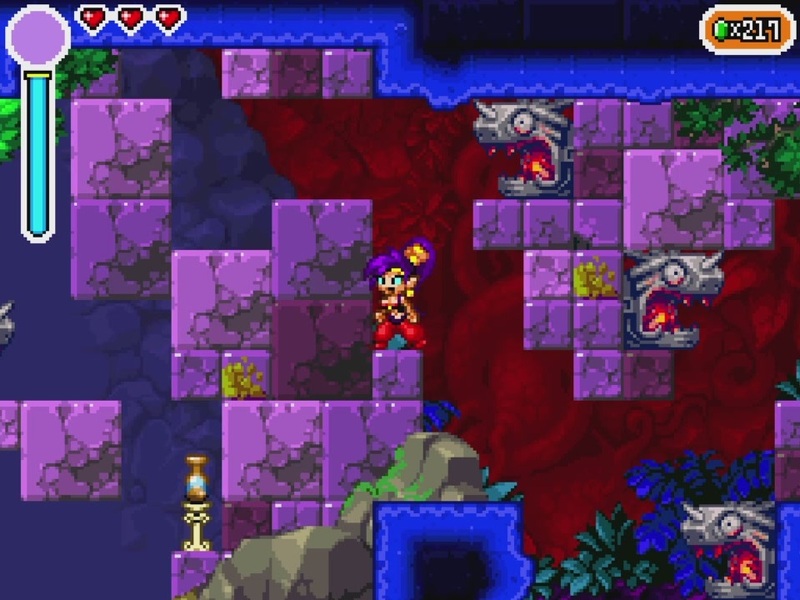 The setup for the second game once again involves an archaeological discovery by Shantae’s adoptive uncle Mimic that Risky wants to get her hands on. This time around, it’s a magic lamp, the significance of which isn’t immediately apparent to anyone in the game world, but which we, the audience, can draw a few conclusions from given our own knowledge of popular myths and legends and the fact Shantae is half-genie. Shantae fails to stop Risky stealing the lamp and finds herself fired as Scuttle Town’s guardian by its rather ungrateful (and, we learn over the course of the series, grossly incompetent) mayor, but she still decides to pursue her rival to find out what she’s up to. Thus begins an adventure similar in concept to the original game, but somewhat different in execution. Probably the most immediately striking contrast between Risky’s Revenge and the original is, as you might expect, presentation. But WayForward didn’t go for a full-on modernisation of Shantae’s world, despite the new game coming out nearly ten years after its predecessor. Instead, the team deliberately adopted a 16-bit aesthetic, featuring large, colourful and well-animated pixel art sprites, several layers of slick parallax scrolling to add visual interest to scenes, and even the sort of quasi-3D scaling and rotation graphical trickery that Super NES developers in particular liked to throw in just to prove their technical mastery. On the audio front, composer Jake Kaufman chose not to emulate either the FM synthesis of the Mega Drive or the wavetable synth of the Super NES and instead plumped for a sonic aesthetic somewhat reminiscent of the Commodore Amiga’s four-channel PCM sound chip, “Paula”. There’s a delightfully crispy 8-bit sample “noisetracker” sound to all the music that gives it a very distinct retro feel without resorting to the cliche of PSG-style chiptunes. It also gives the game a very interesting sense of blending Eastern and Western design philosophies — the game looks like an early ’90s Japanese console game (right down to being in 4:3 aspect ratio), but it sounds like an early ’90s European computer game. The best of two quite different worlds! Besides the aesthetic, one of the most notable differences between Risky’s Revenge and the original Shantae is the additional characterisation and personality the game and its narrative have. The increased resolution and power of the systems that played host to the new game allowed for large, luxurious and beautifully drawn anime-style portraits of Shantae and her friends to complement the dialogue sequences that advanced the story, and overall the writing was a lot better, too, giving us a much better idea of who everyone really “is”. This isn’t to say the original game had no personality at all, of course — quite the opposite, in fact, since its large, gorgeously animated sprites were among the best on the Game Boy Color — but it’s clear Risky’s Revenge was the point where everyone on the team really got a firm grasp of what made this cast tick. One particularly pleasing aspect of this improved sense of characterisation comes in the game’s sense of self-awareness and the fact it isn’t afraid to mock itself. It doesn’t go into full on Neptunia-style fourth-wall breaking, but it also isn’t afraid to do things like reference textual errors in the previous game, such as the part where recurring character Bolo tells you to go “East” when you actually have to go West. 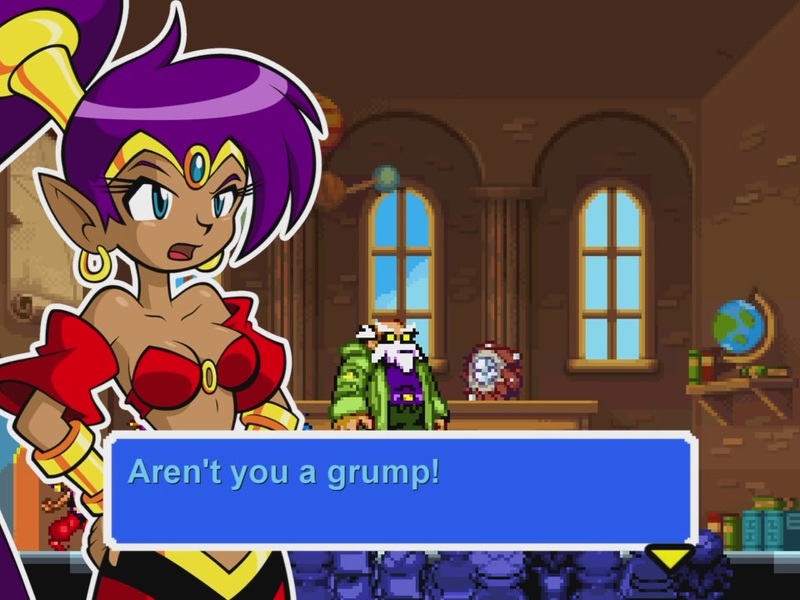 Towards the end of Risky’s Revenge, Shantae’s friends are telling her where she needs to go to start the final showdown, and once again Bolo gives her incorrect directions. This time, his castmate Sky is around, however, and admonishes him for giving Shantae bad advice, mocking him for “not knowing the difference between East and West”. It’s a nice callback to the original that series veterans will get almost immediately, but for those who don’t know the origin of the joke, it’s just a nice moment of friends poking fun at one another. The humour is good-natured and witty for everyone, in other words — not just those who played an obscure Game Boy Color game nearly ten years earlier! The gameplay has had a bit of an overhaul, too. We still have a large, interconnected open world to explore with areas that require particular special abilities before you can access them, but the individual zones are smaller. They’re more dense with hazards and enemies, however, and the newly added ability to move in and out of the background using special floor tiles is much more than a gimmick — it’s mandatory for exploration. We also have a map this time around, though it’s one that drew some criticism for being a bit vague rather than presenting the details of the area you’re exploring. This is ultimately to the game’s benefit, though; it means you have to actually learn your way around the various regions rather than constantly opening and closing your map, and keeps pacing tight. And once you get into the labyrinths for this installment, you’ll find that once again you don’t need a map; they’re designed in an intuitive enough way that you can negotiate them without getting lost. In fact, the three main labyrinths are something of a highlight of the game as a whole, as they each focus on a particular aspect of the game: the first focuses on exploration and finding hidden pathways, the second is effectively a combat-centric “time attack” dungeon, while the third is heavily puzzle- and agility-based. 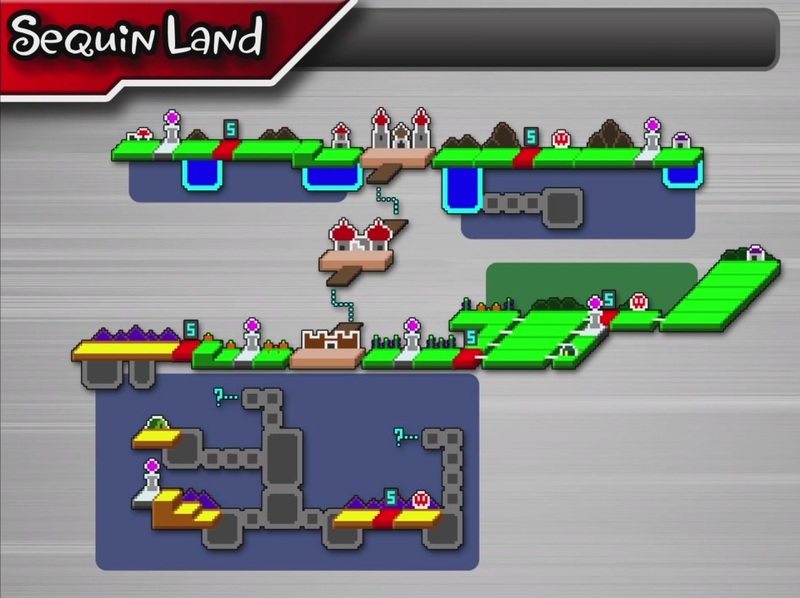 There never feels like there’s any “filler”, even when you’re out in the overworld — as you progress and explore thoroughly, you’ll unlock shortcuts and be able to warp between various landmarks, so you won’t even find yourself having to backtrack all that much — a godsend if you found yourself struggling with the intricate platforming of the Polyp Bay region! The core mechanics have been tweaked somewhat, too. 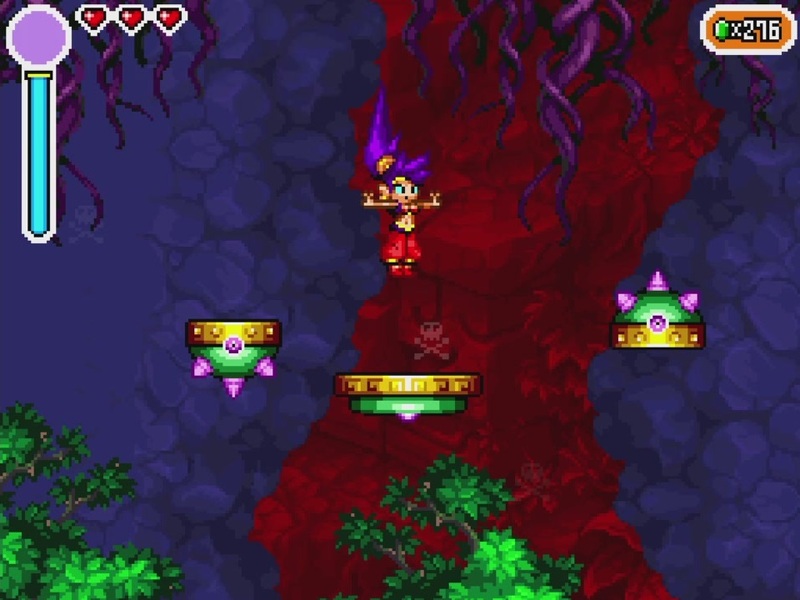 Control is much more responsive and snappy, Shantae’s iconic hair whip attack is a bit less pathetic in terms of damage, particularly if you’ve upgraded it, and the various consumable items from the original game have now become spells that Shantae can cast using power from a bar you can unlock the ability to gradually replenish over time. This makes making use of them much more practical, since you don’t have to remember to stock up on them before going out exploring or dungeon-diving — although unlocking higher-level versions of them is dependent on you finding hidden “Magic Jam” items as well as having enough money to purchase them. In the later stages of the game, recovering these often requires returning to earlier labyrinths with new abilities to access areas you previously couldn’t reach. There are a few differences with Shantae’s transformations, as well, most notably the fact the spider and harpy forms have been dropped, while a mermaid form has been added. There’s also no need to remember button combinations for the dances to use these forms this time around, allowing you to change quickly between them and helping keep the pace quick as a result. And while in the original game it was possible but not essential to unlock additional abilities for each of her other forms, here it’s mandatory to locate these upgrades. Thankfully they aren’t as far off the beaten track as they were in the first game, meaning so long as you’re observant and thorough about exploration you’ll probably run into them accidentally before long. One of them literally can’t be missed, in fact, as it’s a prerequisite to reaching the finale sequence. 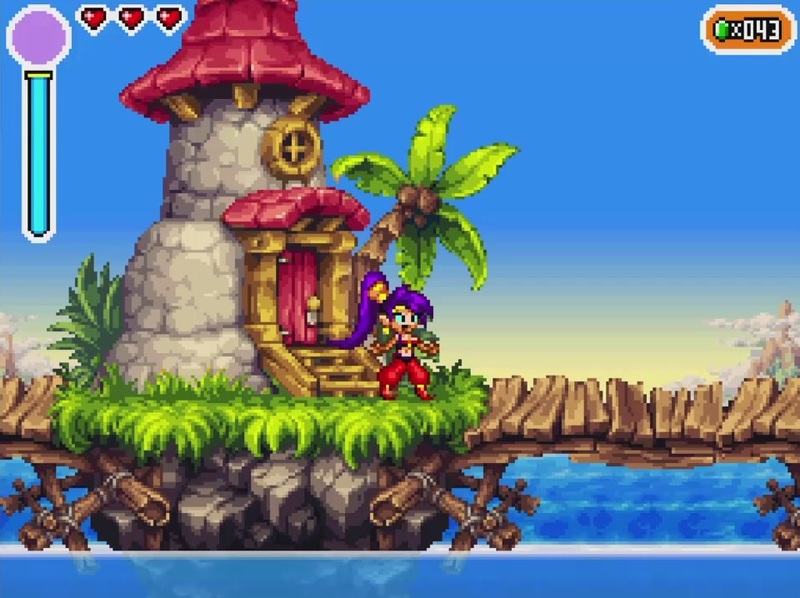 Risky’s Revenge is a great sequel to the original Shantae. 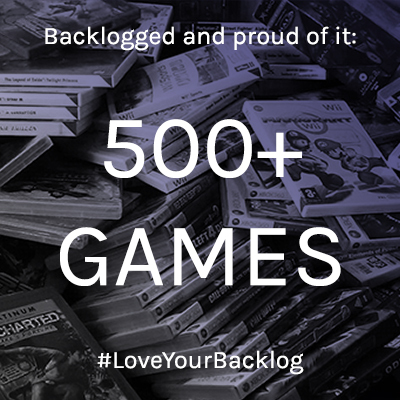 It builds on all the things that made the earlier game great, improves a number of aspects and introduces plenty of new elements of its own. It’s still recognisable as a Shantae game, but there’s enough new about it that it doesn’t feel like a rehash with fancier graphics and sound. Rather, we have a highly enjoyable action-platform adventure that both stands proudly on its own merits — and is an admirable love letter to 16-bit gaming, too. But the best is still yet to come! Previous PostWaifu Wednesday: Risky BootsNext PostMoeGamerTV: MoeGamer on YouTube! It’s definitely worth checking out the older ones if you can. The GBC one can be played on 3DS if you have access to one of those, and Risky’s Revenge is on a whole host of platforms. Currently working through 1/2 Genie Hero, and this seems just as charming, albeit with a somewhat different overall structure to the others.